Below is my list of things I buy every month. I don't make one big trip and buy all these things in one trip. I add them to my cart at the grocery store, department store, online shopping, and whatnot. I spend a little bit every shopping trip or online order to spread out the cost over the month. 1. Canning lids, rings, and jars. I buy canning lids every month. Without fail. At least 3-4 packs of them. I pick up canning rings and jars when I have more room in the budget. I don't really think you can have too many of these things. 2. Soap in any form: bar soap, body wash, dish soap, laundry detergent, castile soap, all purpose soap, disinfectant soap, etc. I usually buy at least 2-3 things of soap every month. Castile soap is probably my favorite soap, but I keep a good variety at home. I really don't think one can have too much soap when you have kids, have a garden, and have livestock. Staying clean is a good thing. 3. Toliet paper. Enough said. I really don't want to be without it. 4. Paper, pens, and pencils. Especially paper. I write a lot down just to remember it. My kids use a fair amount of paper, pens, and pencils for school even though they have computers. We use paper and pencils to draw and to entertain. Paper is important. 5. Ammo - whether ammo for guns, arrows for bows, refill cartridges for anything else. Really, this can not understated. I also think if you buy a little every month, you might not draw as much attention to yourself. 6. Food that will store well: salt, rice, beans, honey, spices, etc. Again, enough said. Food is more than important. It is necessary. Learning how to cook long storing food is a necessary skill. We need food and water. 7. First aid items and medicine. I buy ibuprofen and/or naproxen every month as well as 2-3 first aid items every month without fail. I don't want to be without it even though I have plenty of natural remedies on hand too. Something you just need the little pill to take the aches away. 8. Seeds. I realize you might not be able to find these every month. As soon as they come into the stores, I start buying. I look for seeds that will actually produce food like squash, beans, peas, carrots, etc. I do not buy flower seeds unless they are edible. During the winter, I buy packages of heirloom seeds already packaged in mylar and oxygen absorbers. I have a garden already, but if you don't, please get one started. Gardening is a skill you can't be without. 9. Water. As important as life itself. You need water and liquids to stay hydrated. You and I will not live long without fliuds. Enough said. 10. Reading materials and reference materials. I think this is underestimated by a lot of people, but a good reference library is necessary. As much as I have learned about everything, I still look up things. IN BOOKS. Whoa. I also keep books for enjoyment and to relieve stress. Maybe someday, the internet might be not as reliable or may be heavily censured. You might just want to have a paper copy of things you want to remember. This is my list of things I find necessary to stock up on every month. I find other things necessary to have too, but this list is my buy every month list. Your list might look different and that is okay! 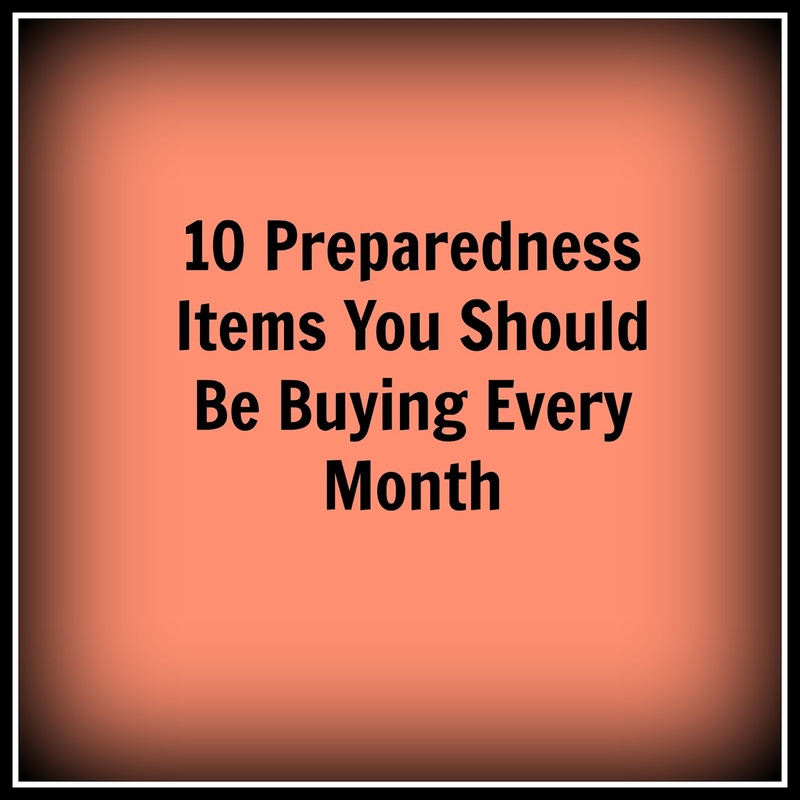 What do you stock up on every month?